Most renters don’t understand the value of buying a home, otherwise they would probably do it. 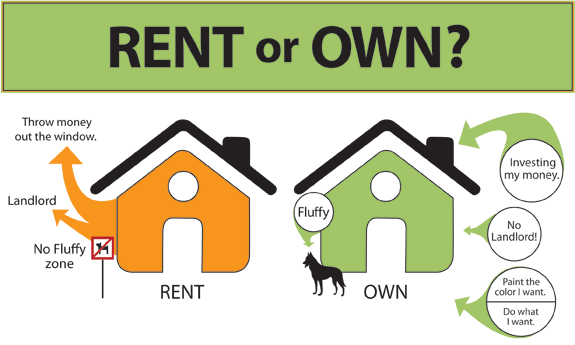 I’m going to share with you some “Myths” of why renters may think it is better to rent instead of buy a home. It should shed some light on why buying is the better option. 1. Myth #1: People choose to rent because it’s more flexible, less commitment. This is a valid reason and makes complete sense. Yet most people who rent are still bound by a lease or contract with a security deposit being held where if you break your lease, you lose that money. Buying a home doesn’t force you to live anywhere as you can always sell it or rent it out to someone else and hopefully make some additional income. Another reason it is good to “commit” to living in a specific neighborhood, is the sense of community or belonging. Most renters rarely get to know their neighbors, nor feel a part of their community. When you buy a home and plan to live there for a while, there’s a different feeling that occurs which enables you to be more likely to befriend your neighbors, join your association and get involved in community events. 2. Myth #2: Many renters believe it is too expensive to buy a home and they must save up for years. Before buying my own home and even becoming a real estate agent, I believed this too until I found out about various programs as well as creative ways to where you may not even have to come out of pocket for anything. That’s right, you can buy a home without any money out of pocket. Now, this will depend if you qualify and what not, but what if you could even buy a home with only $3000 or even $5000 out of pocket. Most landlords expect first, last and security. With rent prices they way they are right now, you’re sure to spend more than $5000 to move into a home. So be sure to contact your local Realtor and lender to find out what programs they can offer you and make sure they are both creative enough to help you. 3. Myth #3: Renters think that a monthly mortgage payment will be more than a rent payment. There are many reasons this statement is 100% NOT True! First, when you buy a home you have an automatic savings account. Meaning, you’re building equity each time you make a payment which can be used later when you either refinance or sell the home and cash out. So rather than paying your landlord’s mortgage and building them equity, you can build your own. Second, you get tax advantages. When you buy a home, you can deduct the mortgage interest on your federal income taxes. Thank you, Uncle Sam! Third, your monthly payment never goes up, where your rental payment could go up each year. For 30 years, you’re locked into a payment that you approved and can afford. Renting never guarantees that. 4. Myth #4: Renting gives you freedom. In some instances, that is true. Yet, many landlords will not allow you to paint rooms, change or add things to the home or even let you simply hang pictures on the wall. I wouldn’t necessarily call that “freedom”. When you own your home, you’re able to do whatever you want (at least what your association allows if you live in one). You can paint whatever color walls you want, plant whatever plants you want, change your flooring, kitchen, bathrooms, etc. without having to ask permission from anyone. You can now see how buying a home versus renting a home certainly has its benefits. Probably of most importance is the financial savings & benefits, yet in many ways the connection of community can be just as important. These days, many people don’t have that sense of community and one way to get it, is to buy a home. Not sure where to start? Click here to learn more or contact a local real estate agent and lender to help you get started. Check out this quick intro video as well.